One day left on our auction, check it out. Raised Seal of Washington State and signed index card from the office of Washington governor Clarence D. Martin. Martin served two terms as the governor of the state of Washington from 1933 to 1940. 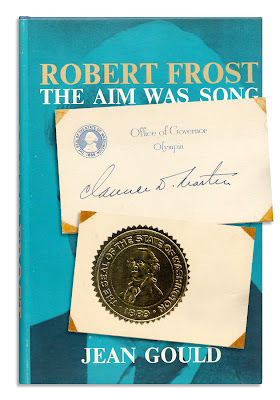 Found in "Robert Frost: The Aim Was Song" by Jean Gould. Published by Dodd and Mead, 1964.